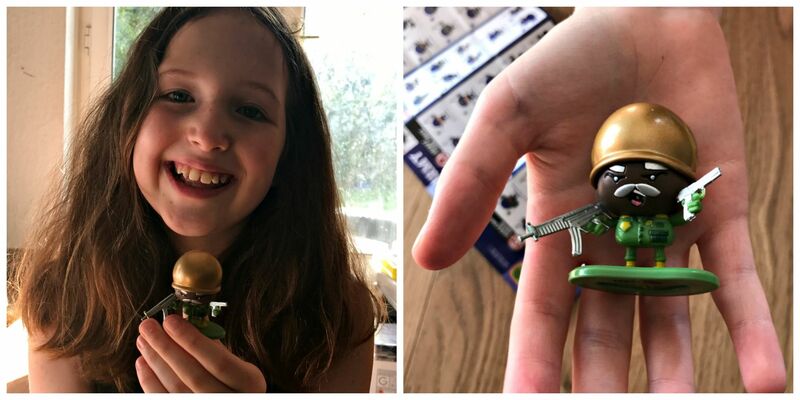 After years of indulging Caitlin’s passion for Shopkins and Cupcake Surprise, it made a nice change to review a collectable that Ieuan showed some interest in – Awesome Little Green Men. Awesome Little Green Men is the name of a military collectable which also includes a table top (or floor) game to play. Actually, the name is a little misleading because there are also little blue military men to collect. Figures can be bought singly or in collections and there are also ‘blind boxes’ where you chance your luck to see if you get a super rare figure. We received the Awesome Little Green Men Battle Pack and two blind boxes to open. You can enlist your figures online so you can track which ones you already have. The little military figures are given a rank, role and squadron – they even come with their own dog tag which the kids can wear. The Battle Pack contains 8 soldiers, 8 dog tags, 1 chain, 1 new recruit poster, game pieces and a game guide. There are 100 unique characters to collect in Series 1, including four super rare figures in the green army and the blue army. Each figure has their own expression which helps you recognise which is which – they are quite distinct. For example, Major Boo-Boo drives a little ambulance and Corporal Kickbutt has a gun. The game is based on the concept of paintball when the aim is to ‘hit’ members of the opposing army. There is obviously a strong incentive to buy extra soldiers here so that the rivalling armies are of a similar size. Our current blue army is decidedly underpowered. You line your armies up facing one another and move by using two sliders – stickers which you need to stick to a coin. There’s a marching one so that you can move closer before your strike, and an attack one which you flick at the opposition to see who you can hit. I think that’s basically it. 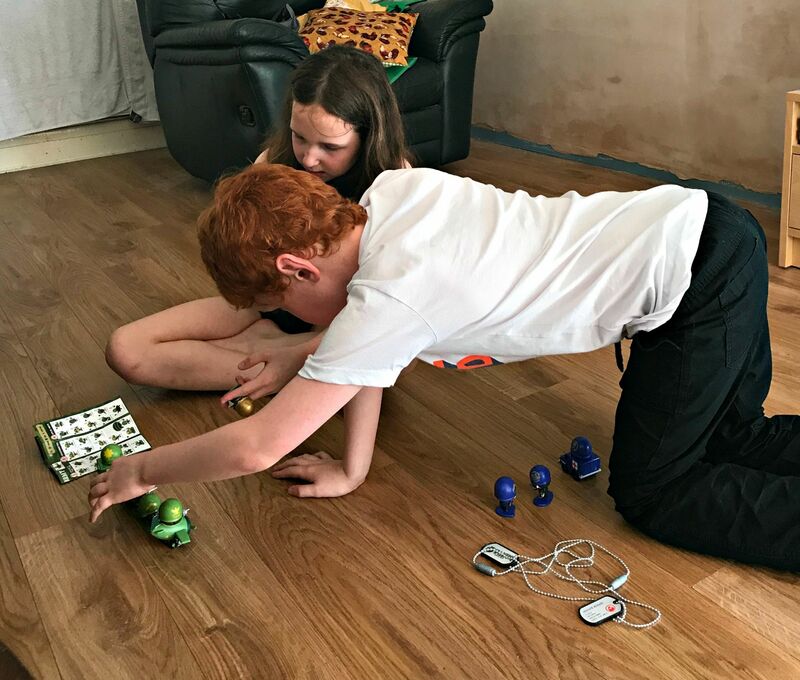 Hands up I did find the game slightly confusing and Caitlin and Ieuan just wanted to play with the figures and make up their own stories. You can, however, find full instructions both in the Deluxe Pack and print them off online too. 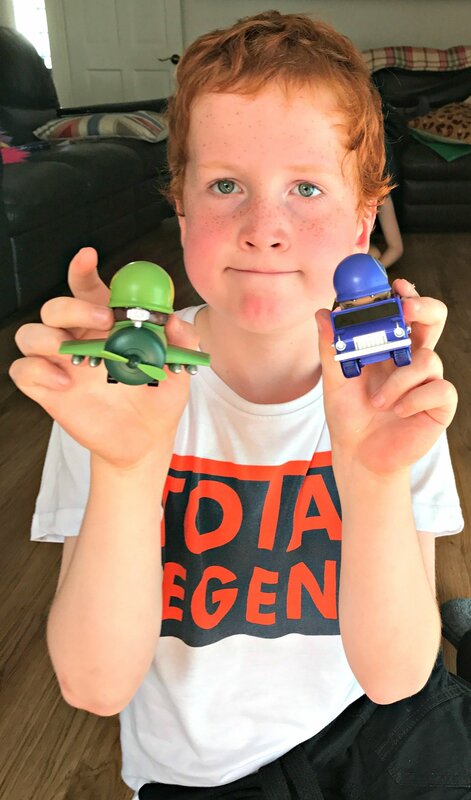 The stated age range is 6+ but I think the game is better suited to older children and I suspect that Awesome Little Green (and blue) Men will work best as collectables. The figures are really well made and quite amusing (for us adults a little more ‘in the know’). They are also a decent size and are unlikely to be lost down the back of the sofa or in the carpet somewhere. Always a bonus! I am sure there will be some parents who will object to the military aspect of the game. (I was once taken to task at the traffic lights by a mother objecting to Ieuan carrying a toy gun!). I think you have to be pragmatic about these things and the introductory video on the product’s website states that the reason the two armies are fighting is not serious – for example, it could be that they are contesting the superiority of ketchup over mayonnaise. (Mayonnaise on chips. Weird, no?). 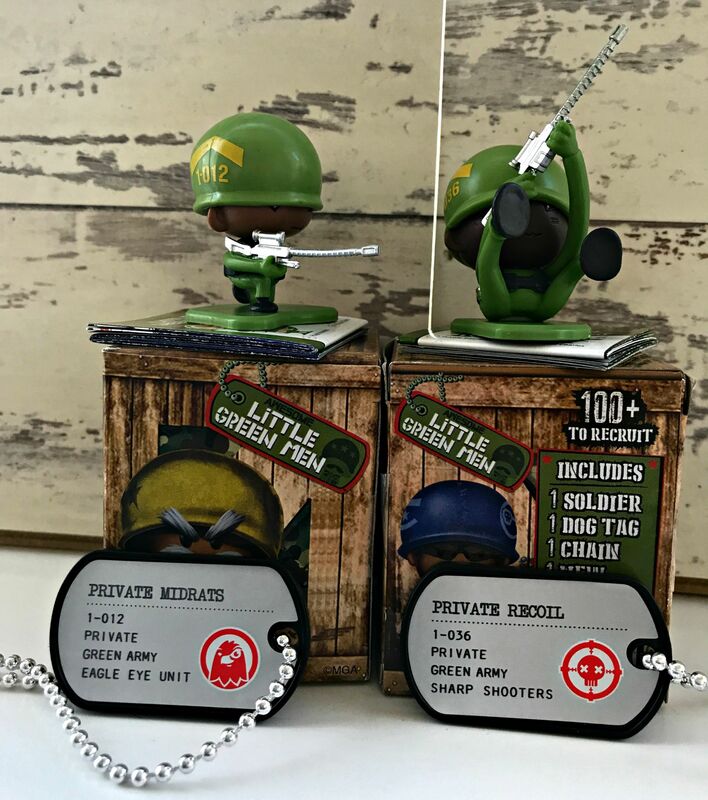 The Awesome Little Green Men Blind Box is RRP £3.99 and comes with one soldier, one dog-tag, a new recruits poster and game guide. The Awesome Little Green Men Starter Pack is RRP £12.99 and comes with four soldiers (one in a vehicle), four dog-tags, a new recruits poster and game guide. But who’s in the blind box? The Awesome Little Green Battle Pack is RRP £24.99 and comes with eight soldiers (three in a vehicle), eight dog-tags, a new recruits poster and game guide. 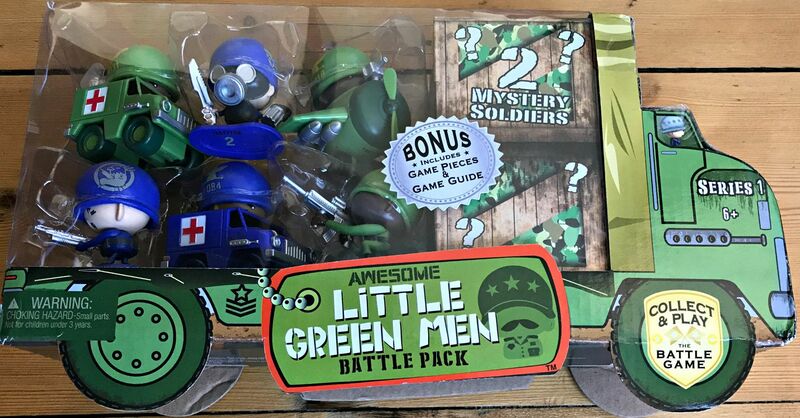 To find out more information about Awesome Little Green Men and The Battle Game, visit https://awesomelittlegreenmen.mgae.com. You can find them on Amazon or at ToysRUs. Read more of our toy reviews here. "Win A Luxury Tartan Lambswool Blanket To Keep Cosy This Autumn"
"Problem Page Edition 38 2017"